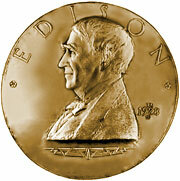 The Congressional Gold Medal presented to Thomas Edison, 1928. “A person of high character and remarkable achievement holds a fascination for all mankind. It is literally true that the world will make a beaten path to his door. Such persons are the leaders who by their example and their wisdom stimulate their fellow men to better things and are in the main responsible for human progress. They are the pioneers in opening up new territory in our physical surroundings and in the domain of thought. Not only the United States but other regions in the far-off ends of the earth are pausing to-night to pay their tribute of respect and reverence to such a figure, while he is still with us, in appreciation of what he has done to advance the cause of civilization. 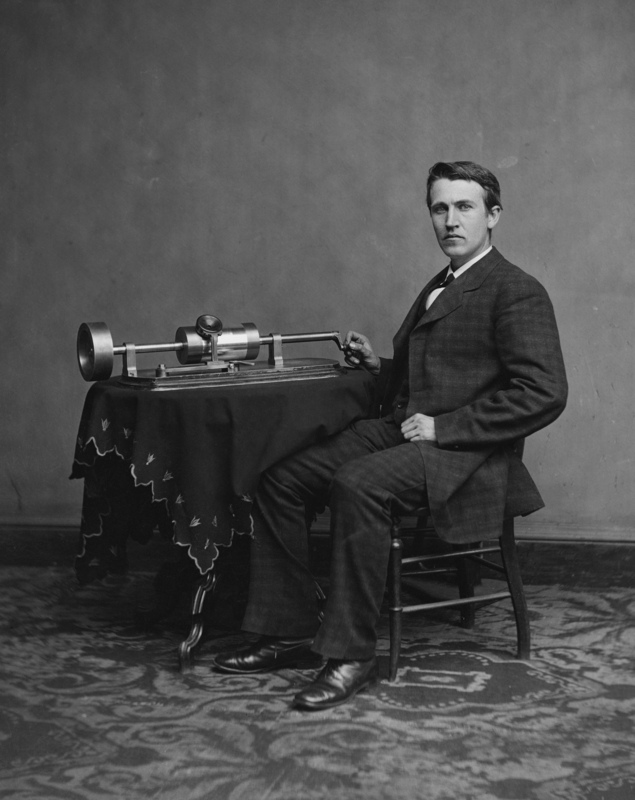 “The life of Thomas Alva Edison, master of applied science, has been represented as a romance. He has been called a genius, a wizard. While these terms may well be used to describe his great abilities, yet this remarkably modest man has constantly refused to attribute such qualities to himself. In his blunt and homely way he is quoted as having said that genius is made up of 1 per cent inspiration and 99 per cent perspiration. Even if not literally true, this expresses an important idea, which he has not failed to apply. Carrying on the same thought he is said to have made an adaptation of the well-known maxim to the effect that everything comes to him who hustles while he waits. Rather than to any mysterious power, he attributes his success to intelligent and persistent hard work along the practical lines of applied science. 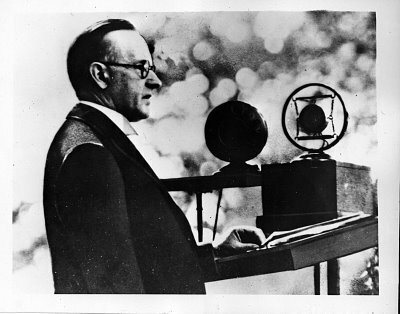 Secretary Mellon presenting Edison with the Congressional Gold Medal approved by President Coolidge, whose remarks were carried by radio to mark this occasion. 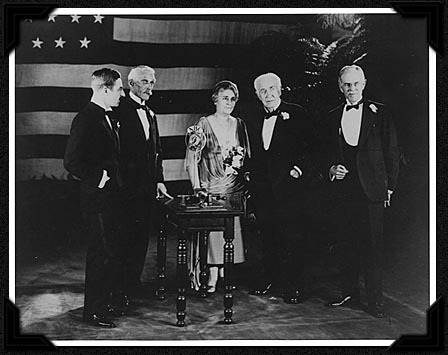 L to R: Ronald Campbell (British Embassy, present to return the original phonograph lent by Edison to the British Science Museum 45 years earlier), Mellon, Mina and Thomas Edison, with John Hibben, President of Princeton University. Courtesy of the Smithsonian Institution. “That Edison was endowed at birth with that rare intellect and wisdom given to those who have helped shape our destinies, few will deny. But, when asked on his seventy-seventh birthday for his philosophy of life, the reply was: ‘Work – bringing out the secrets of nature and applying them for the happiness of man.’ His goal always has been some useful objective. Rarely has he wasted his energies. Having carefully determined what needed to be accomplished, he has gone ahead with the unerring instinct of a seeker after truth, with an indomitable spirit for accurate research, with an infinite capacity for taking pains. Temporary failure has only spurred him to renewed activity. Few men have possessed to such a striking degree the blending of the imagination of the dreamer with the practical, driving force of the doer. In the record of his inventions and improvements rests the unimpeachable testimony that he has brought things to pass. “I have been interested in his account of a visit to the White House in 1878 to exhibit his newly developed phonograph. He relates that he came at 11 o’clock in the evening upon the invitation of President Hayes, who, with Mrs. Hayes and their guests, became so engrossed in the marvelous device that the inventor did not get away until 3.30. But we know that Edison has never made a practice of retiring early. Young Edison with his phonograph at Washington, April 1978. Photograph by Matthew Brady. “The field of electricity will be most closely associated in future years with the name of Edison. It has been asserted somewhere that there is scarcely an electrical process or instrument of to-day which does not reflect in some way changes wrought by his researches. Steinmetz, who should be an authority, said Edison had done more than any other man to promote the art and science of electrical engineering. In his invention of the incandescent lamp and in the perfection of means for developing and distributing electrical energy he literally brought light to the dark places of the earth. Through these and other products of his genius old industrial processes have been revolutionized, new ones developed, and our daily lives have been made easier, our homes pleasanter and more comfortable. “Although Edison belongs to the world, the United States takes pride in the thought that his rise from humble beginnings and his unceasing struggle to overcome the obstacles on the road to success well illustrate the spirit of our country. We are happy to share his achievements as our contribution to progress. He represents the finest traditions of our citizenship. At the request of the Secretary of the Navy in 1915 he became president of the Naval Consulting Board, which looked into inventions and devices designed to aid us in preparedness and later in our participation in the World War. From 1917 to 1919 his entire time was at the disposal of the Government. Not only by his own discoveries, but by training in his laboratories men who have gone out to important places in the scientific and industrial world and by encouraging countless others to renewed efforts in applied science and invention, he has made a notable contribution to education. Edison in 1911. Courtesy of Machina Ex Spiritus/Laiz Kuczynski. Government did not build Edison. He, like the rest of us, built and continues to sustain our Government. Confusion over this natural order of importance, frankly, is why under our “global” economy, no Edison exists today. America, and the world, is poorer for that fact. 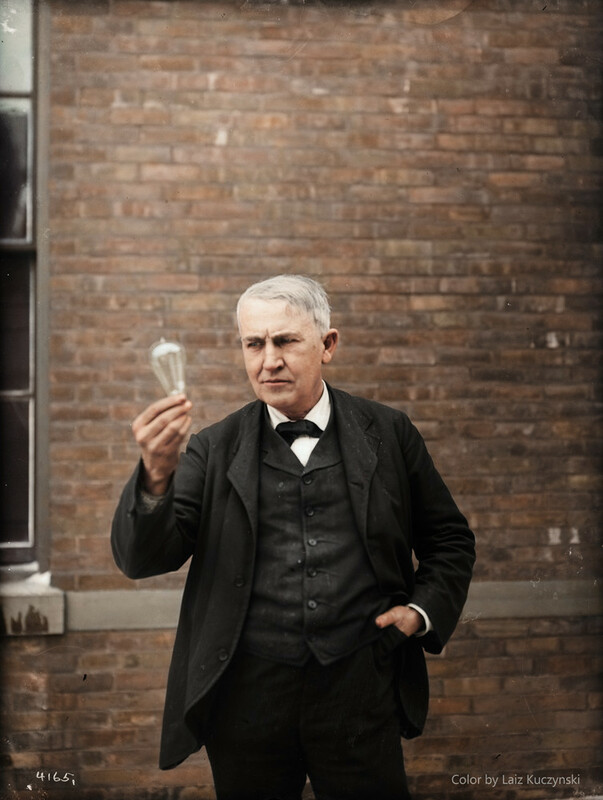 Though Edison appropriated the ideas of others on occasion just as government does sometimes serve as patron to great achievers, the exceptions do not make the rule. There can be no quantifying the number of jobs Edison created in his lifetime through many hours of hard, even menial, work. Candidates, with all their election time rhetoric, would do well to remember this next time they presume to take credit for the number of jobs created or when they assert that businesses are built by government outlay, not people free to dream, dare and do. 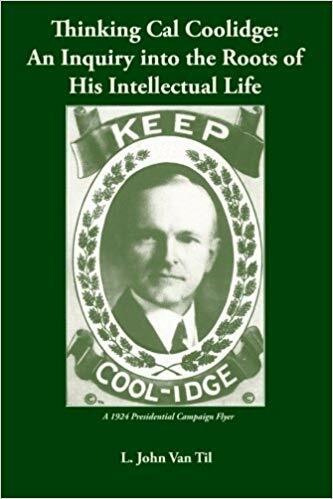 Statesmen from Hayes to Coolidge understood that most self-evident of realities — economic growth comes through our freedom to keep the rewards of our labor, to take risks, to succeed and to fail, to work more for ourselves than at Washington’s gracious allowance. Businesses, even Edison himself, still needed to understand and cherish that truth as much as government does now. Keeping that environment robust and strong through maximized opportunity under consistently observed laws, government is supposed to function not as an active participant in allocating labor, capital, production or wages but as an advocate for capitalism prevailing on all parties alike, without favor, prejudice or hostility. Greater opportunities, higher standards of living and progress for everyone materialize when this balance is preserved. Getting off the field of play and observing budgetary economy accomplishes infinitely more than anything else government could ever do to help this process perpetuate, and self-regulate. Government inserting itself continually in the reward of friends, arbitrary suspension of market rules, and punishment of those who refuse to make special application to the public Treasury stunts and infects a healthy, growing marketplace. Yet, the leverage of government’s power as middle-man never diminishes but only increases and cements itself as long as we continue to petition it and allow intervention. We know why, then, too many candidates seem utterly, and willfully, clueless when it comes to what built Edison and how our economic system, when properly constituted and fueled, operates. 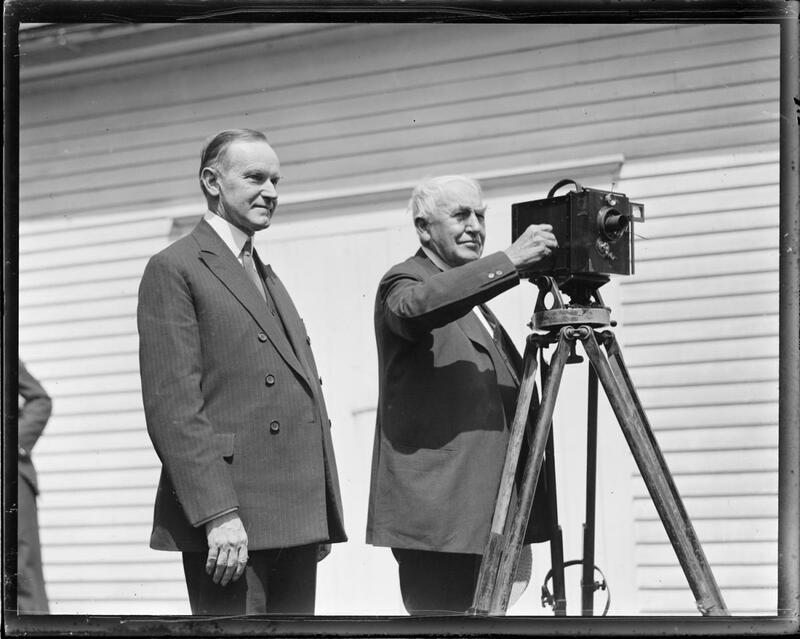 Coolidge and Edison during the inventor’s visit to Plymouth Notch, August 1924. Courtesy of Leslie Jones Photography.